Product #3200 | SKU M32AD | 0.0 (no ratings yet) Thanks for your rating! 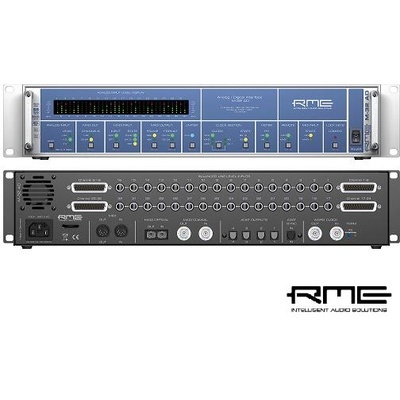 The M-32 AD from RME is an extremely high-quality 32-channel A/D converter. It utilizes MADI (Multi-channel Audio Digital Interface) technology, which allows up to 64 channels of audio to flow freely without the shortcomings of multi-core cable-based digital audio technology. Not only does the M-32 AD provide pristine audio circuitry, the great converters, and RME's famous SteadyClock technology, but the MADI protocol also enables incredibly long cable runs of over 2000 meters! In order to put the M-32 AD to use, you need to have a computer with either an internal RME MADI card (such as the HDSP MADI), or an external RME MADI interface (like the HDSPe MADIface). The additional MADI port on the rear of the M-32 AD facilitates stacking multiple units together, which makes it possible to take advantage of the full 64-channels that this system is capable of delivering. With that magnitude of power, combined with the ability to send these signals great distances, makes this system a powerful tool for a wide range of professional applications.